Temple, TX, June 13, 2018—“Pop-up” stores are all the rage for landowners and property managers with vacant space. Now, with Rapid Retail there’s no waiting for a Pop-up operator to come to you to fill the empty space. Rapid Retail contract services delivers property managers a streamlined menu of retail options to eliminate or prevent empty store fronts, deterioration of the structure or equipment, maintain foot traffic and keep customers coming back. StrasGlobal implements Rapid Retail in small format convenience, QSR, coffee shops, yogurt shops, even quick lube shops with a program that is geared toward short duration tenancy providing smooth transition to new tenant. 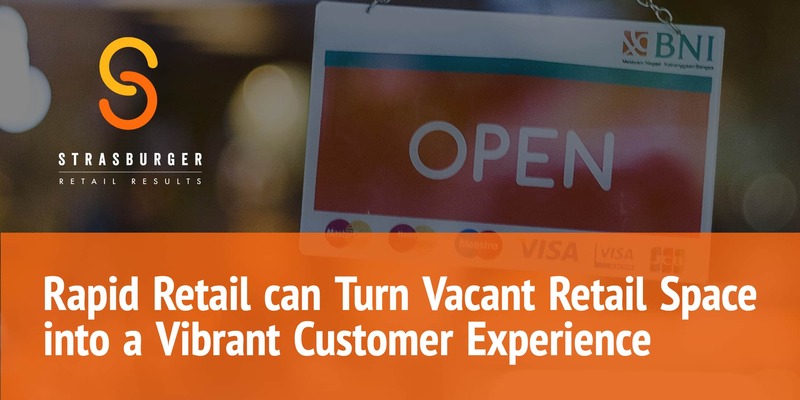 In other words, Rapid Retail is designed to start off as a typical Pop-up store but then can be transitioned to a new long term tenant. Rapid Retail clients include financial institutions and oil companies that need someone to operate foreclosed stores or sites if a dealer goes out of business. Rapid Retail will obtain all required permits and licenses, ships pre-bundled signage, equipment and furniture for finished out space, hire local staff, begin training process and delivery of products. “Our assortment of retail offers is completely turn-key including signage, furniture, product selection and staffing. Thanks to our fee-based approach you can determine the economic value of implementing the Rapid Retail solution before you commit to do so”, said Roy Strasburger, President, StrasGlobal. For 35 years StrasGlobal has been the choice of global brands, distressed assets managers, real estate lenders and private investors seeking a complete, turnkey retail management solution from the most experienced team in the industry.